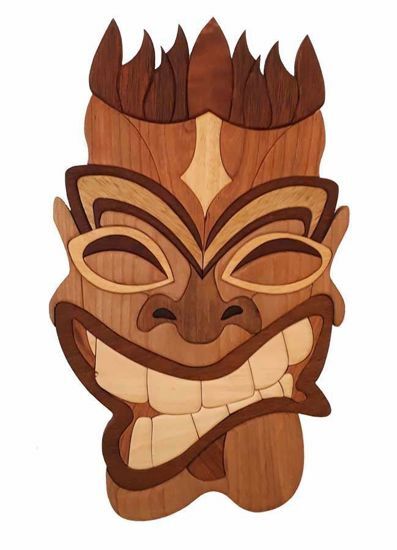 Intarsia Wood Art made by solid wood - "Tiki Mask". 3D Wall Art for your Living Room as a Rustic Home Decor. An Original Artwork for You. The Tiki Mask is made up of 52 separate pieces of wood. There are thirteen different types of wood: Poplar, Cherry, Afrormosia, Alder, Walnut, Teak, Obeche, Padauk, Sapelli, Limba, Beech, Merbau, Wenge. They are glued together on an MDF panel.